Yes,I am one among those minority folks who start baking for Christmas very late.I keep postponing the chopping-fruits-soaking part to the last possible time.But once I start,then there's no stopping.I have kept aside batches of soaked fruits delegating them for Xmas,New Year,for keeping,for giving away and so on.Light Fruit Cake was a great start and I am taking it forward with this delicious Fruit Cake from Saee's Myjhola. 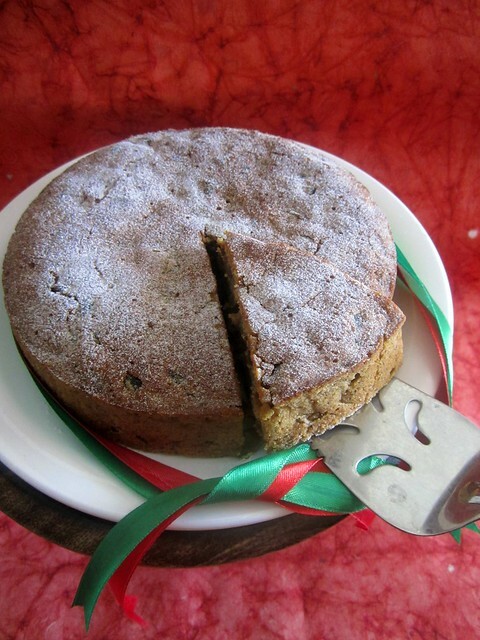 Nothing beats the thrill of cutting a slice of homemade cake and even better if you are sharing it with someone.Fruit Cakes get a lot of bad press due to their characteristic chock-a-block fruits in every bite and a strong smell of alcohol.Maybe because I love dry fruits or maybe because I grew up eating Plum Cakes,as they are called in Kerala,I love a good Fruit Cake! 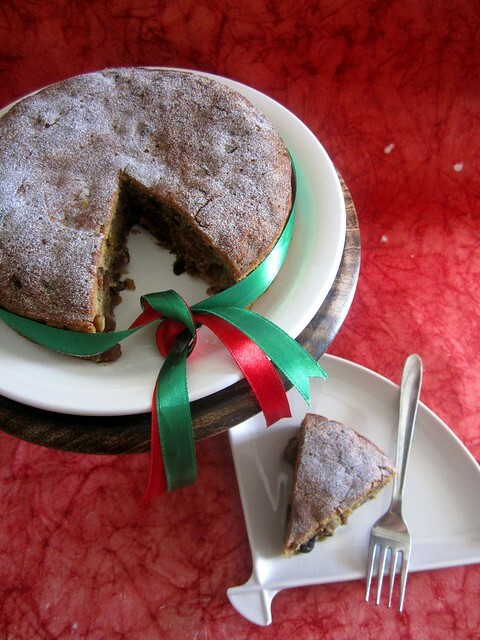 Saee's recipe is a very simple one.It is just like a regular butter cake with fruits and nuts soaked in rum incorporated into the batter and voila,it immediately gets transformed into a rich fruit cake,so very Christmas-ssy! 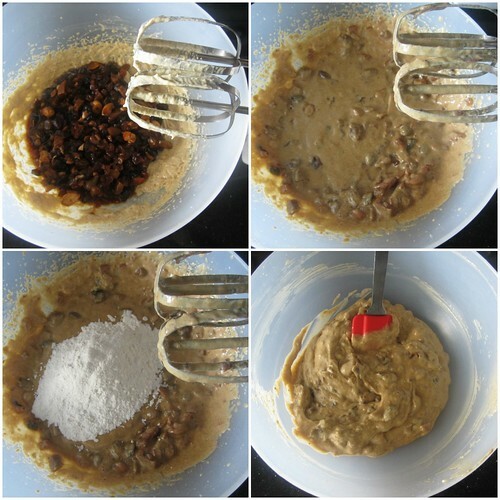 In a clean dry bowl,mix together the dry fruits,nuts,tutty fruity,cinnamon powder and dark rum using a wooden spoon.Store in an airtight container and refrigerate for 2-3 days.You can even do this days in advance,the more it soaks,the more flavor it brings to the cake. 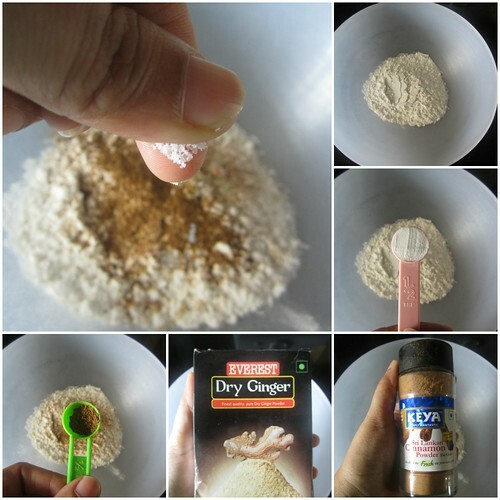 Sift/stir together flour,baking powder,cinnamon powder,dry ginger powder,garam masala and salt.Reserve. Beat together butter and sugar till fluffy.Mix in the eggs beating well after each addition. Pour the soaked fruits along with any juice into the creamed butter-sugar mix and stir well. 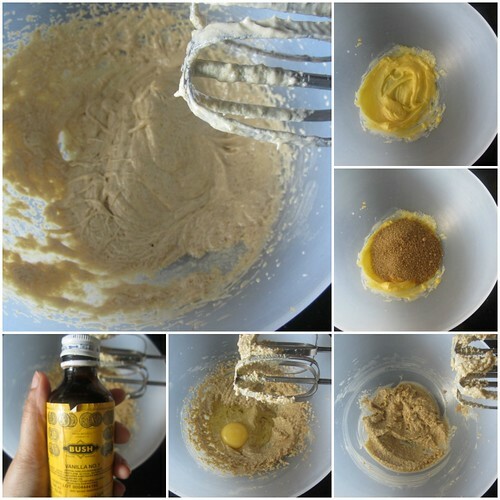 Mix in the sifted flour mix and beat together till you get a thickish batter. Pour into a greased/lined 8' round tin and bake at a 180C preheated oven for 45 minutes to an hour. Remove the cake from the tin and let it cool completely on a wire rack.Cover with a foil and rest the cake for a day or two before slicing. 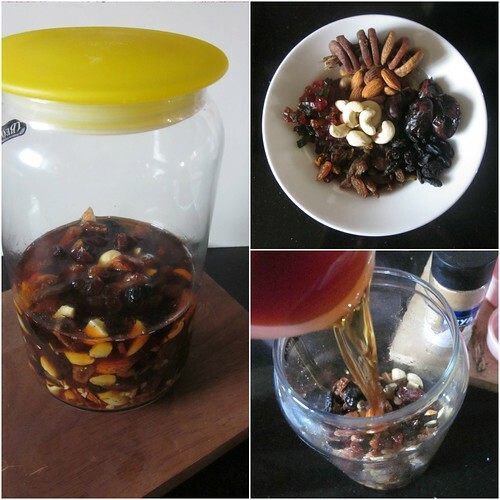 You can mix and match any fruits and nuts of your choice.I have soaked a batch with only glaze cherries and tutti fruity,it is all about what you like to have in your fruit cake. I added less rum than mentioned and for the same reason,did not drain the soaked fruits before adding to the cake batter. Are you done with your Christmas preparations yet? 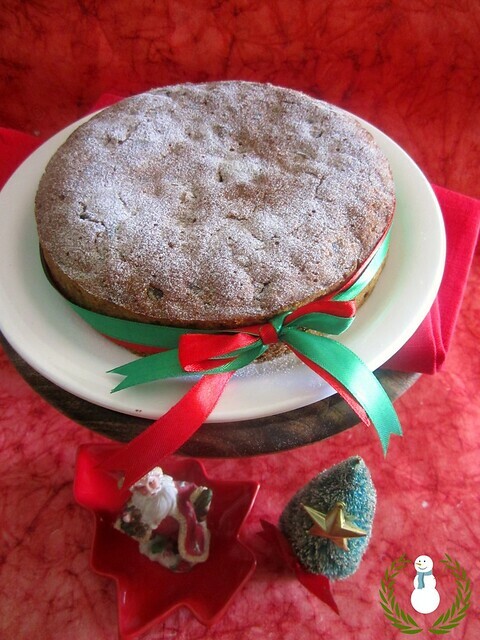 I know christmas isn't same without the cake that is why i make them too :-) IThe cake looks yumm i think i will opt for a lighter cake too next year. Christmas preparation done on nooooo it is not even half way have too much to do as i am hosting the christmas eve dinner in my place and have still shopping to do , thankgo we only give presents on new year otherwise i would be in trouble. Cake looks yumm, Am just wondering why we should use a wooden spoon to stir the fruits. Is there any particular reason for that? Since we are using alcohol to soak the fruits,it helps if you use any non-acidic utensils. Loved the last pic! Its brilliant! Would love to see a pic of the slice from the side...top view pics don't give any idea of the crumb, even distribution of nuts and the moist/dry texture. 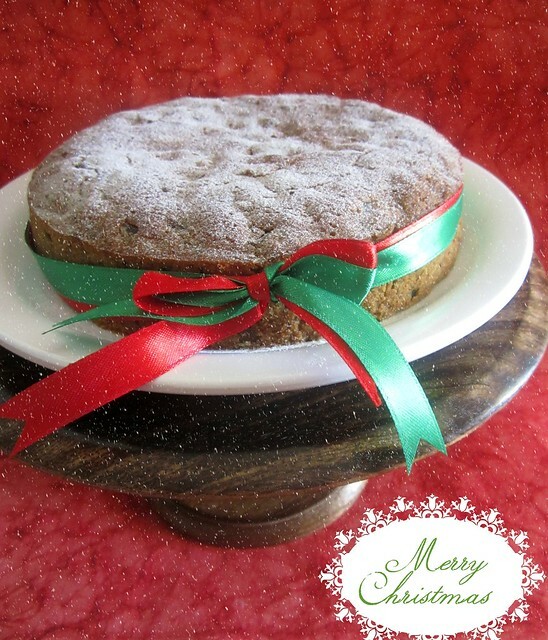 Am ready with a list of cakes and cookies too, thats really wonderful to see your fruit cake finally,nothing will replace this christmas fruit cake na. Orange juice can be used in place of rum!